Aerial picture of the the city of Thunder Bay on the shores of Lake Superior - a major service centre for Northwestern Ontario, Canada. by Lake Superior, Ontario, Canada. Although European settlement began in the 17th century, the city of Thunder Bay was established through the amalgamation of the two separate cities of Port Arthur and Fort William in 1970. This merger also included the towns of McIntyre and Neebing. 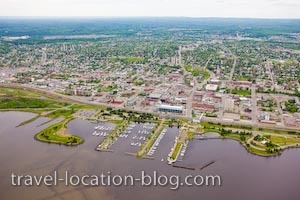 Thunder Bay is the Northwestern most navigation point on the Great Lakes shipping network and is sometimes dubbed as either Canadian Lakehead or just Lakehead. An extensive network of parks exist in the city for the pleasure of residents and visitors alike including the Marina Park right on the lakefront.